A woman’s dream (and some men) would be the largest shopping mall in the country with the addition of an amazing theme park all in one. We could shop till we drop and then get our thrills and chills while riding coasters and rides all in the same location. Many would say I am crazy for such talk, but this is exactly the case in Minnesota at the Mall of America. One of the thrilling coasters inside of the mall is the Fairly Odd Coaster. This family oriented coaster is a spinning wild mouse style coaster that was built inside the mall in 2004. 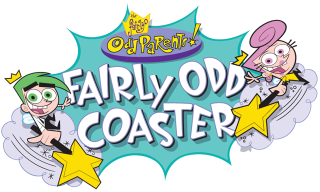 The ride opened up as Timberland Twister, but has since been rethemed and renamed after a Nickelodeon show called the Fairly OddParents. The coaster features individual cars that seat guests facing each other. The cars spin around as they traverse the track. The ride was built by the Gerstlauer Company and installed in the park by Ride Entertainment Group which does all the work in the West for Gerstlauer. The spinning wild mouse style coaster reaches a height of 54 feet and reaches speeds of 31 mph. The coaster track is 1,345 feet in length and is laid out in the twister style. So as you are shopping inside the grandest mall in the country, give your feet a break and come with us now as we put you on a virtual ride of the Fairly Odd Coaster. With the mall’s skylights hanging overhead, guests enter the small queue area for the coaster. As you arrive at the coaster station, you board one of the multi-colored cars. As the car leaves the station, it takes a sharp turn to the right and then ascends the lift hill very quickly. At the top, the car veers to the right and goes down a small wave drop to the right. The car begins to spin as you traverse a sidewinder track back and forth. The car continues to spin and down a banked 36 foot drop and up into a break run. The car then swoops down for the final run as it banks right and then left and speeds through a semi helix. The car then hits the final brakes and slowly arrives back into the station. So the next time you are in the Mall of America, head over to Nickelodeon Universe and enjoy all of the thrill rides and coasters the park has to offer.